Jerome Fischer (“that’s what my mother named me”), the newest addition to the Mix 96.9 family, is the host of afternoon drive on Mix 96.9. 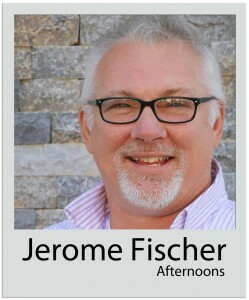 Jerome, hails from Oceanside, California and is better known in the market, and by his friends as “Fish”. Jerome is a single father of five children – Dylan, Jade, Trevor, Kingston and Lily, and a brand new granddaughter. The oldest is a Marine, the youngest…a princess! “Fish” served in the US Army in Ft. Clayton Panama, Central America. He loves music, the outdoors, animals, fantasy football, reading, doing voice overs and production. “Fish” began his radio career 25+ years ago in cities from San Francisco to Orlando, and many points between! He loves what he does, as well as the people at Mix 96.9, and says that north Alabama is the longest he’s ever stayed in one area…some places just feel like home.